Simply hooks over and under the rear tailgate of the camper van without the need to drill. The door can remain in use when the bikes are fitted, although it will require support when opening. 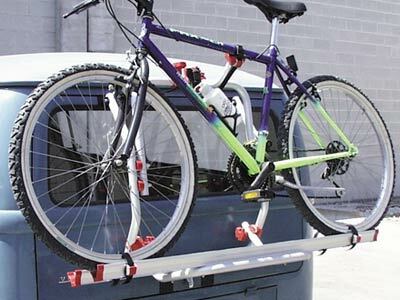 Supplied as standard with: 2x Rail Quick C (bike support), 1x Bike-Block Pro 1 and 2 (Carry-Bike frame to bike holder and Security Strip (buckled strap). Supplied as standard to carry 2-bikes.